Billy: A comeback? Comebacks are for has-beens, right? The difference between a really bad tear-jerker and one that works generally comes down to the caliber of performances found within a given film. Hack acting can do little to really sell the often hokey high drama found in this genre, but when the cast is on their game it is easy to get the viewer's waterworks a-flowing. Witness the intended results in this 1979 Franco Zeffirelli remake of the 1931 Wallace Beery/Jackie Cooper classic, in which he substitutes Jon Voight and Ricky Schroder (he wasn't yet "Rick") in the leads. Voight is the hard-drinking and gambling former boxing champ Billy Flynn, now struggling to eek out a living at a horse track in Florida. In between bouts of the bottle and dice, he's working to raise his eight-year-old son TJ (Ricky Schroder), a tossled-headed little tyke who is remarkably well-adjusted considering his dad (whom he calls "Champ") is a raging booze-hound. The two have one of those oddly idyllic father/son relationships that can only be found in movies, the kind that isn't threatened even when Billy swipes $20 out of his kid's piggy bank to go gambling. Trouble begins brewing when Billy's ex-wife (and TJ's mother), Annie (Faye Dunaway), now remarried to a wealthy doctor, shows up at the track one day and, not surprisingly, takes an interest in the son she never knew. Zeffirelli, who at the time had a few notable film versions of Shakespeare's works under his belt, also knows how to create an almost operatic level of drama in The Champ, and it works very well here. Even though the wealth and poverty issues between Annie and Billy are hammered out a bit loudly, the script tosses in a few rough dramatic edges to keep the whole thing from becoming too sugary or one-dimensional, with an all-out weeper of a final act. 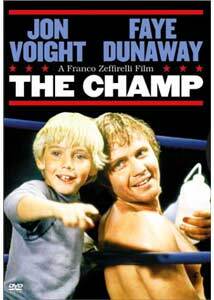 Even with a solid performance by Voight, and an understated one by Dunaway, The Champ is really all about Schroder. He refrains from the typically cutesy child actor histrionics, and he delivers one of those even-keeled and natural performances that is rarely seen by eight-year-old actors. Sometimes his lines are a little melodramatic, but damn if the kid doesn't milk every ounce of emotion out of them. He cries like a pro, and if you don't get a little misty-eyed at least twice during this film you are simply a cold-hearted cynic, or without a heart completely. Image Transfer Review: Warner has issued The Champ in a generally solid 1.85:1 anamorphic widescreen transfer. Given the film's age, the resulting image transfer is largely nick-free, with a few sequences peppered with the occasional white speck. Colors are not overly robust, and tend to run a little soft, a look not so uncommon in late 1970s films. The exterior shots look quite good (particularly the racetrack scenes), but some of the interiors suffer from inadequate black levels and inconsistent fleshtones. Some small compression issues, particularly a bit of shimmer and ringing, is not a major problem. The majority of this disc looks very respectable, with really only a few small segments marred by apparent image transfer flaws. Audio Transfer Review: The Dolby Digital 2.0 stereo track dates this film terribly, and provides little or no enhancement to the viewing experience; in fact it only serves to remind the viewer that they're watching a film from 1979. There is no depth to the sometimes shrill soundfield whatsoever, and the fidelity range is extremely limited resulting in inherent overall flatness. Extras Review: Jon Voight and Rick Schroder provide a full-length, scene-specific commentary, and they both admit this is their first time watching the film together. Their reminiscences, dominated primarily by Voight, relate in large part to acting styles and approaches, with a few relevant production anecdotes (many involving improvisation) here and there. The two have a nice rapport (though I found their speaking voices to be very similar), but they don't really shed any deep insight into the film. Is that necessarily a bad thing? Not really, I guess. If you're a real fan of The Champ, I think you'll find this an enjoyable, if not slightly lightweight, commentary. I may be wrong, but I thought I caught Schroder getting a bit choked up during the big, weepy climax, and when he professed to being proud of The Champ, I didn't have any reason to doubt him. A vacuous and thankfully brief 1979 puff piece entitled On Location With The Champ (06m:47s) trots out Voight and Dunaway to make vague comments, while the bulk of the piece is mostly behind-the-scenes footage, including an abundance of shots of the apparently always smiling Zeffirelli. The jive, deep-voiced announcer is cringe-inducing, by the way. A theatrical trailer, 29 chapters and subtitles (English, French, Spanish, Portuguese) round out the extras. The back cover states that a trailer for the 1931 original version of The Champ is on this disc, but it couldn't be found. There's always room for a decent tear-jerker on my DVD shelf, and The Champ fits that bill handsomely. Even with some of the maudlin heart-yanking machinations orchestrated by Zeffirelli, it is the unbelievably natural performance by little Ricky Schroder that makes this film the emotional treat that it is. Get out the hankies, boys.